Many Many Best Wishes "Happy Birthday" to search engine giant GOOGLE on it's 12th successive year - We all should thank Google for making our online life simpler, organized, beautiful, informative and for sharing so many great website's/product's all for FREE to the world! Check out Google.com today and you will notice Google Universal Logo converted into a Birthday Cake (loooking not so much delicious :-) with a single candle, I think they should get 12 candles for celebrating their 12th birth anniversary atleast to the logo image. 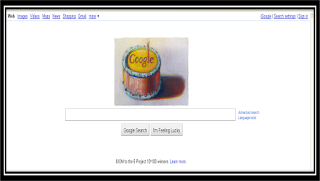 Anyways, the alternate text to Google 12th Birthday Logo Image say's "Happy 12th Birthday Google by Wayne Thiebaud. Image used with permission of VAGA NY." Wayne Thiebaud (born November 15, 1920) is an American painter whose most famous works are of cakes, pastries, boots, toilets, toys and lipsticks. His last name is pronounced "Tee-bo." He is associated with the Pop art movement because of his interest in objects of mass culture, although his works, executed during the fifties and sixties, slightly predate the works of the classic pop artists. Thiebaud uses heavy pigment and exaggerated colors to depict his subjects, and the well-defined shadows characteristic of advertisements are almost always included in his work.